Discover the best drugstore makeup for under $10 each. The best foundation makeup can be bought for a small amount of money if you look carefully. The world of makeup is a tricky one. Just about anyone walking through a drugstore has seen the aisles of cheap makeup that many of us wear. For all those beauty fashionistas out there, we also know that there is another world of high-end, runway model makeup brands with incredible price stickers on them. Brands like Lorac, Smashbox, Make Up For Ever, and MAC can be your best friend for your wedding, prom, photo shoot or just a fancy night out. But for all the days in between, many girls (such as myself) often just wear the simple stuff. Believe it or not, there are some pretty good makeup items to be found for under $10 in the drugstore, you just need to know what to look for. Here is a selection of my personal favorites and what I consider the best drugstore makeup you can buy. I have never found a better tube of mascara than Revlon Fabulash Grow Luscious Mascara. I have tried just about every drugstore brand and many of the more expensive ones, but nothing compares. I buy this mascara over and over again because it doesn’t clump and it makes my eyelashes look thick and sky high every day. A sneak peak at my casual day-to-day makeup bag! One of my personal favorites that I use religiously is Boots Expert Sensitive Hydrating cream. I have raved about this moisturizer in a few other articles here at Makeup Tips Magazine. This water-based moisturizer comes cheap at $5, and the formula is a wonderfully light, cold cream. It works amazingly for women with acne, rosacea, or just plain sensitive skin. I have extremely fair skin, so it has always been really difficult for me to find a drugstore foundation that was light enough to truly match my skin tone. I also have dry skin that is pretty acne prone, so finding one that blended properly is next to impossible. However, I found L’Oreal’s True Match Super Blendable liquid makeup in a small glass jar and haven’t gone back. They have at least 30 different shades for every skin color and the jar lasts forever. These little jars are some of the best drugstore makeup items I have found. One thing to remember about foundation in a bottle, however, is that you should always pour a drop onto a clean foundation brush instead of using your finger. Fingertips can easily transfer bacteria into the bottle and then become acne on your face. I’ve found a few good, cheap lipsticks over the years, but the majority of them have been from NYC. This brand can be found in many drugstores like Walgreens, Rite Aid, and Target. I love their Sugar Plum shade! There are a lot of brands of lip balm to choose from, and I’ve found a lot of good ones over time. Recently, however, I was introduced to the Alba collection and fell in love. I currently have the Alba Passionfruit Nectar lip balm in my makeup bag. It tastes and smells wonderful and only cost me a couple of dollars. My current favorite drugstore eyeliner is a knock-off brand called Prestige Total Intensity. It is a dark olive green with light shimmer eyeliner that really makes my eyes stand out. I’ve kept this eyeliner around because it doesn’t smudge off even on hot days, and seems to stick to my waterline a lot better than other cheap brands have. 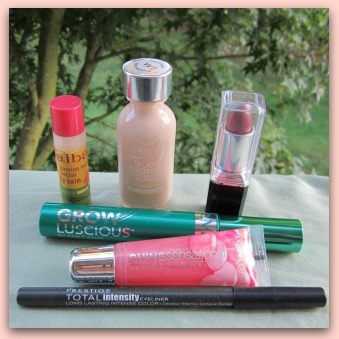 And there you are with my top picks for the best drugstore makeup you can buy!